Furthermore, compound bows are usually used with a peep sight. Make sure you install yours in the optimal position according to your dominant eye, stance, and form. The simplest way to do it is to draw your bow as if you were to shoot, close both of your eyes and then open your dominant eye. The part of the string you see right in front of you is where you should install your peep sight. The grip plays a big role in the accuracy and speed of each arrow shot. When holding your compound bow, you should make sure the weight of the bow is evenly distributed in the space between your fingers and your thumb (the center of your palm). If you feel that you’re holding the bow with your wrist or your fingers, you should try and see how to improve your grip. 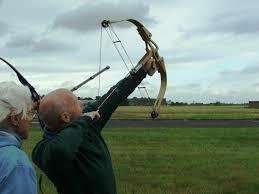 A commonly used technique is to make an L with your index and thumb and then placing the bow so it lays aside your index finger and the center is in the “corner” or the L.
The trick with drawing and anchoring is to consciously control the movement and to always pull to the same position. There are two common anchor points to help define and repeat the perfect position – the point when your bow is fully drawn against your cheek, and the tip of your nose on your string.